WASHINGTON, DC -- A Malaysia Airlines Boeing 777 with 295 people aboard was shot down on Thursday by a surface-to-air missile, American officials have confirmed. The plane was traveling at about 30,000 feet (9,144 meters), according to tracking information from a military spy satellite. The satellite was unable to detect where exactly the missile was fired. Military and intelligence analysts are using mathematical formulas, high-speed computers and other sensors to try to pin down the missile’s point of origin. Other analysts will work with the Ukrainian authorities to recover and analyze pieces of the missile and the aircraft to help determine what kind of missile was fired, the officials said. The plane crashed and burned on Thursday in an eastern Ukraine wheat field near the Russian border, in an area roiled by fighting between pro-Russian separatists and Ukrainian forces. Ukrainian officials called the crash an act of terrorism. “This is truly a grave situation,” Mr. Biden said. 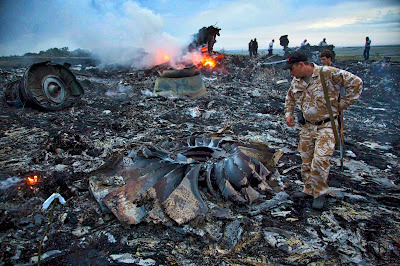 Ukraine’s president, Petro O. Poroshenko, said in a statement that he was calling for an immediate investigation of the crash of the plane, which was en route to Kuala Lumpur, Malaysia, from Amsterdam. There were no reported survivors among the 280 passengers and 15 crew members. Mr. Poroshenko said he had called the Dutch prime minister, Mark Rutte, to express his condolences and to invite Dutch experts to assist in the investigation. “I would like to note that we are calling this not an incident, not a catastrophe, but a terrorist act,” Mr. Poroshenko said. Malaysia’s prime minister, Najib Razak, called for an investigation at the crash site and the unfettered cooperation of local authorities. “Malaysia is unable to verify the cause of this tragedy,” he said. “No stone will be left unturned,” he added. President Obama spoke with Mr. Poroshenko and Russia’s president, Vladimir V. Putin, from aboard Air Force One. Reporters arriving at the scene near the town of Hrabovo described dozens of lifeless bodies strewn about, mostly intact, in a field dotted with purple flowers, with remnants of the plane scattered across a road lined with fire engines and emergency vehicles. “It fell down in pieces,” said one rescue worker as tents were set up to gather the dead. One passenger in a black sweater lay on her back, with blood streaming down her face and her left arm raised. The carcass of the plane was still smoldering, and rescue workers moved through the dark field with flashlights. Dogs barked in the distance, and the air was filled with a bitter smell. A regional airline official said the plane had been flying at about 33,000 feet (10,000 meters) when radar lost track of it. For months, eastern Ukraine has been the scene of a violent pro-Russian separatist uprising in which a number of military aircraft have been downed. But this would be the first commercial airline disaster to result from the hostilities. Despite the turmoil in eastern Ukraine, the commercial airspace over that part of the country is heavily trafficked and has remained open. Aeroflot, Russia’s national carrier, announced that it had suspended all flights to Ukraine for at least three days. Malaysia Airlines, still reeling from the mysterious loss of another Boeing 777 flight in March, said it had lost contact with Thursday’s flight, MH17, over Ukraine but offered no further details immediately. Mr. Razak said initially in a Twitter post that he was “shocked by reports that an MH plane crashed. President Obama, who one day earlier had announced strengthened sanctions against Russia over its support for the eastern Ukraine separatists, spoke by telephone with Mr. Putin, who raised the issue of the reports of the downed plane, White House officials said. Josh Earnest, the White House press secretary, said Mr. Obama had been briefed about the plane crash. Later Mr. Obama said the United States government was working to determine whether any Americans had been aboard the flight. Russia’s Interfax news agency said there had been no Russians aboard. There was no immediate word from the Kremlin about the substance of the Obama-Putin telephone call. The Kremlin put out a short statement saying that Putin had a previously scheduled telephone conversation with Mr. Obama. “The parties had a detailed discussion about the crisis in Ukraine,” the statement said. Putin repeated the need for an immediate cease-fire and objected to what he said was Ukrainian army fire striking inside Russia. Russian news agencies said Putin also spoke by telephone to the president of Malaysia and offered his condolences. Mr. Rutte, the Dutch prime minister, said in a statement said he was “deeply shocked” by the crash. “A lot remains unclear about the reason, circumstances and those on board,” he said. The Dutch state news agency quoted tour operator WTC.nl as saying that around 20 to 30 Dutch and Belgian citizens had been on board. Andrei Purgin, deputy prime minister of the Donetsk People’s Republic, the insurgent group in eastern Ukraine, denied in a telephone interview that the rebels had anything to do with the loss of the passenger jet. He said that the rebels had shot down Ukrainian planes before but that their antiaircraft weapons could reach only to around 4,000 meters (13,000 feet), far below the cruising level of passenger jets. “We don’t have the technical ability to hit a plane at that height,” he said. He said that the plane had apparently come down in an area of Ukrainian military operations and that it was not out of the question that the Ukrainians themselves shot it down. “Remember the Black Sea plane disaster,” he said, referring to the 2001 crash of a Siberian Airlines passenger jet bound for Novosibirsk from Tel Aviv that the Ukrainians shot down by accident during a military training exercise. Anton Heraschenko, an adviser at Ukraine’s Interior Ministry, said on his Facebook page that the Malaysia Airlines plane had been brought down by a Russian-made Buk, or Beech, antiaircraft system. Russian missile systems are named for trees. A reference book published by Rosoboronexport, the Russian state weapons export monopoly, describes the Buk antiaircraft missile system as designed to target both low- and high-flying aircraft, to a maximum height of 72,000 feet (22,000 meters). Mr. Heraschenko wrote that earlier Thursday people in eastern Ukraine supporting the central government had reported seeing a Buk system moved from the town of Torez toward the town of Snezhnoye. He said the rebel forces did not have the Buk system. In comments broadcast on Ukrainian television, Vitali Klitschko, the mayor of Kiev and former heavyweight boxing champion, said the crash illustrated the risks to peace in Europe of the fighting in eastern Ukraine. “This is not just a local conflict in Donetsk and Luhansk but a full-scale war in the center of Europe,” he said.